(Nanowerk News) Researchers have discovered a way to create a highly sensitive chemical sensor based on the crystalline flaws in graphene sheets. The imperfections have unique electronic properties that the researchers were able to exploit to increase sensitivity to absorbed gas molecules by 300 times. The study is available online in advance of print in Nature Communications ("Chemical sensing with switchable transport channels in graphene grain boundaries"). Amin Salehi- Khojin, asstistant professor of mechanical and industrial engineering is in the lab with Mohammad Asadi, graduate student and Bijandra Kumar, post doc where they are doing research in graphene sensors. When a graphene lattice or sheet is formed, its polycrystalline structure has random boundaries between the single-crystal grains. The properties of the lattice are significantly affected by these "grain boundaries," said Amin Salehi-Khojin, UIC assistant professor of mechanical and industrial engineering and principal investigator on the study. In many applications, grain boundaries are considered faults because they scatter electrons and may weaken the lattice. But Salehi-Khojin and his colleagues showed that these imperfections are important to the working of graphene-based gas sensors. They created a micron-sized, individual graphene grain boundary in order to probe its electronic properties and study its role in gas sensing. Their first discovery was that gas molecules are attracted to the grain boundary and accumulate there, rather than on the graphene crystal, making it the ideal spot for sensing gas molecules. A grain boundary's electrical properties attract molecules to its surface. "It's as though we have multiple switches in parallel," said graduate student Poya Yasaei, first author on the paper. "Gas molecules accumulate on the grain boundary; there is a charge transfer; and, because these channels are all paralleled together, all the channels abruptly open or close. We see a very sharp response." "We can synthesize these grain boundaries on a micrometer scale in a controlled way," Kumar said. "We can easily fabricate chip-scale sensor arrays using these grain boundaries for real-world use." 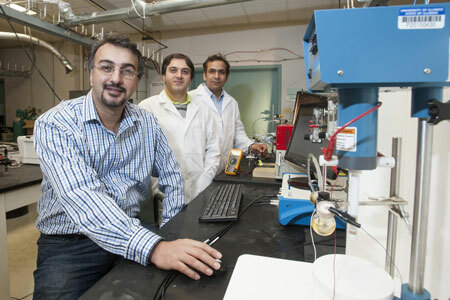 Salehi-Khojin said it should be possible to "tune" the electronic properties of graphene grain-boundary arrays using controlled doping to obtain a fingerprint response -- thus creating a reliable and stable "electronic nose." With the grain boundary's strong attraction for gas molecules and the extraordinarily sharp response to any charge transfer, such an electronic nose might be able to detect even a single gas molecule, Salehi-Khojin believes, and would make an ideal sensor.